C, W6NNH Choctaw's President present the fire chief with a copy of the "Now Your Talking" book which was donated by the ARRL. The members of the Choctaw ARC from Choctaw, Oklahoma collected their loose change at club events for the past two years and was able to raise the funds necessary to purchase a set of ARRL library books to present to the library manager Rosemary Czarski. 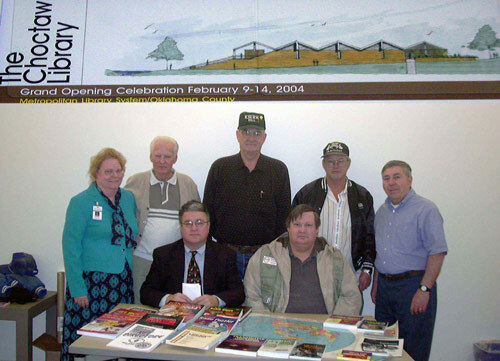 The presentation was made on February 9, 2004 that started a week of activity for the grand opening of the new Choctaw Library. The library had been in a temporary location ever since the May 3, 1999 category 5 tornado had destroyed the old library, along with half of the cities other buildings. John Thomason-WB5SYT OK Section Manager indicates: "This effort of the Choctaw ARC, a very strong and active League affiliated club, represents the usefulness of Amateur Radio clubs extending themselves into the community to have visibility and recognition. " Choctaw ARC receives ARRL Certificate. The Choctaw ARC has been recognized by the ARRL for it's contribution to the BPL fund. We received a letter from the director of the Mid-Del Food Pantry thanking the Choctaw ARC for there contributions over the Christmas holidays. I think that we should donate to this worthwhile organization twice a year. Let have a Christmas in July donation beside our regular Christmas dinner donation. If every member where to bring one or two items it would really help them. I know because I volunteer there. They always are in need of paper items, sugar, flour beside needing various can goods. If you bring them I will see that they get to the food pantry. Thanks for everyones support! 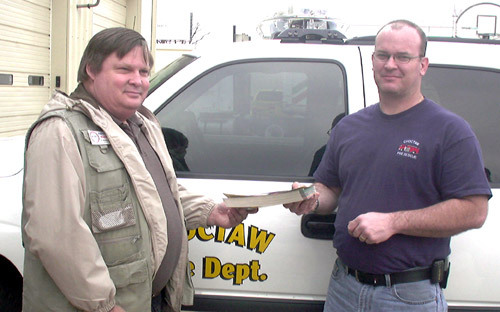 After the May 8, 2003 tornado hit the City of Choctaw eight of our club members volunteered 70 hours of their time providing communication support for the Salvation Army. We learned many valuable lessons during this time. There is more we could do and plans are under way to see that we are better prepared for the next disaster. To all of you that helped thanks! Remember the '*' DTMF tone must precede every Echolink command you send. So, if you wanted to call to Echolink Node #12345, you would send a '*' for a second, then without unkeying, send the 12345 sequence and then release the PTT. a second then send the '#' DTMF tone. Here's a short list of Echolink commands to print off. * Make the Echolink controller ID. 00 Connect to a random node. 01 Connect to a random link. 02 Connect to a random conference bridge. 03 Connect to a random user. 08 Echolink station connection status. 09 Reconnect to last call. There's another thing new too; an activity tone has been added that will key up the repeater every minute and send a tone to indicate that some is connected via Echolink. The club has decided to add a PL tone to our 2 meter repeater. We will use 141.3. Remember to set all your radios both input and output. If you are having any problems please bring it to the attention of one of our club officers.